Synthetic peptide within Human Histone H2A aa 100 to the C-terminus (C terminal) conjugated to keyhole limpet haemocyanin. The exact sequence is proprietary. WB: HeLa nuclear extract. Calf thymus histone preparation. Histone H2A Recombinant Protein. ChIP: Chromatin from U-2 OS cells. IHC-P: Human testis tissue. IP: Histone H2A IP in HeLa whole cell lysate. ICC/IF: HeLa cells. Our Abpromise guarantee covers the use of ab18255 in the following tested applications. ChIP - Anti-Histone H2A antibody - ChIP Grade (ab18255)Reamon-Buettner and Borlak PLoS One. 2012;7(6):e38531. doi: 10.1371/journal.pone.0038531. Epub 2012 Jun 6. Fig 4. 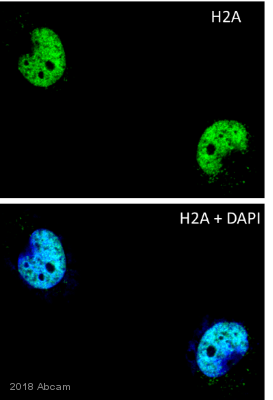 Myc affects the incorporation levels of histone variant H2A.Z. qChIP was performed using specific antibodies recognizing A. H2A.Z, B. H2A.Zac, Panel D. H2A, E. H2AK5ac and G. H1. All the qChIP values are expressed as % of input and normalized for total histone H3, with the exception of C and F, where H2A.Z acetylation is noramlized for H2A.Z density, and H2AK5 acetylation is normalized for H2A density, respectively. The box plots show the fold change distribution of each acetylated residue for the two subpopulations. 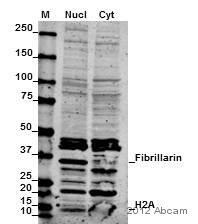 Western blot - Anti-Histone H2A antibody - ChIP Grade (ab18255)Colpitts et al PLoS One. 2011;6(9):e24365. doi: 10.1371/journal.pone.0024365. Epub 2011 Sep 1. Fig 5. DENV expression disrupts histone oligomerization. Huh7 cells were transfected with DEN2 C and/or infected with DEN2 24 h post-transfection. Cells were lysed 24 h post-infection (48 h post-transfection) and lysates were run on 4–12% SDS-PAGE gel. 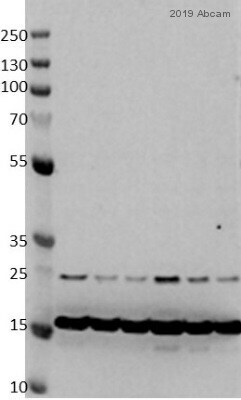 Gels were used in a Western blotting assay with antibodies against histones H2A ab18255 (A), H2B (B), H3 (C) and H4 (D); monomers, dimers and octamers are indicated. Gels were stripped and reprobed with an antibody against actin as a protein loading control. The same amount of protein was loaded in each lane for each gel as a control for expression. Immunocytochemistry/ Immunofluorescence - Anti-Histone H2A antibody - ChIP Grade (ab18255)Colpitts et al PLoS One. 2011;6(9):e24365. doi: 10.1371/journal.pone.0024365. Epub 2011 Sep 1. Fig 2. DENV C colocalizes with histones in Huh7 liver cells. DEN2 C colocalized with H2A (A), H2B (B), H3 (C) and H4 (D) in Huh7 cells. Cells were transfected with GFP-DEN2 C and fixed in 4% paraformaldehyde 48 h post-transfection. Cells were stained with antibodies against histones and a TRITC secondary antibody. Cells were counterstained with DAPI to visualize the nucleus. GFP-DEN2 C expression is green, histone staining is red and DAPI is blue. Cells were fixed with formaldehyde for 10 min. The ChIP was performed with 25 µg of chromatin, 6 µL of ab18255 (blue), and 20 µL of Protein A/G sepharose beads. No antibody was added to the beads control (yellow). The immunoprecipitated DNA was quantified by real time PCR (Taqman approach for active and inactive loci, Sybr green approach for heterochromatic loci). Primers and probes are located in the first kb of the transcribed region. ab18255 staining histone H2A in human testis tissue, showing a distinct and strong nuclear staining pattern at cells in ductus seminiferus. Paraffin embedded human tissue was incubated with ab18255 (1/1200 dilution) for 30 mins at room temperature. Antigen retrieval was performed by heat induction in citrate buffer pH 6. Histone H2A - ChIP Grade was immunoprecipitated using 0.5 mg HeLa (Human epithelial cell line from cervix adenocarcinoma) whole cell extract, 5 µg of Rabbit polyclonal to and 50 µL of protein G magnetic beads (+). No antibody was added to the control (-). The antibody was incubated under agitation with Protein G beads for 10 min, HeLa whole cell extract lysate diluted in RIPA buffer was added to each sample and incubated for a further 10 min under agitation. 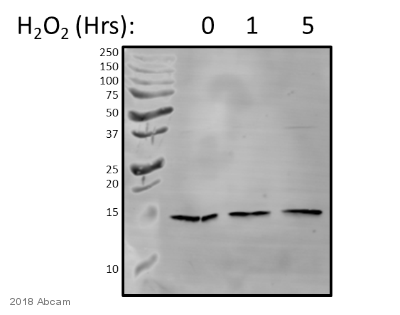 Proteins were eluted by addition of 40 µL SDS loading buffer and incubated for 10 min at 70°C; 10 µL of each sample was separated on a SDS PAGE gel, transferred to a nitrocellulose membrane, blocked with 5% BSA and probed with ab18255. ab18255 is partially blocked by the immunizing peptide ab19751. There is an additional band at 22kDa in HeLa lysate which is attributed to cross-reactivity. ICC/IF image of ab18255 stained HeLa (Human epithelial cell line from cervix adenocarcinoma) cells. The cells were fixed in 100% methanol (5 min) then permeabilized using 0.1% PBS-Triton and then incubated in 1% BSA / 10% normal goat serum / 0.3M glycine in 0.1% PBS-Tween for 1h to further permeabilize the cells and block non-specific protein-protein interactions. 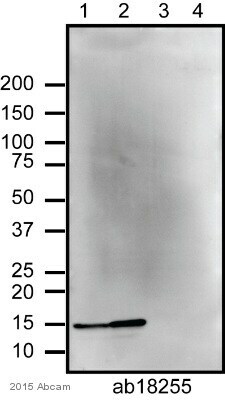 The cells were then incubated with the antibody ab18255 at 1 µg/ml overnight at +4°C. The secondary antibody (pseudo-colored green) was Alexa Fluor® 488 goat anti- rabbit (ab150081) IgG (H+L) preadsorbed, used at a 1/1000 dilution for 1h. Alexa Fluor® 594 WGA was used to label plasma membranes (pseudo-colored red) at a 1/200 dilution for 1h at room temperature. DAPI was used to stain the cell nuclei (pseudo-colored blue) at a concentration of 1.43 µM for 1 hour at room temperature. Publishing research using ab18255? Please let us know so that we can cite the reference in this datasheet. I am working with antibodies ab11175 (H2AX) and ab18255 (H2A) and I am exploring the possibility of setting up ELISA assays with these antibodies. I was wondering if you can tell me if you have any data on these antibodies being used in ELISA, if you have any recommendations for antibody pairing, or any H2A or H2AX ELISA kits available. ab11175 and ab18255 were never used togteher in Sandwich ELISA. These however can be used in Indirect ELISA. The sELISA application totally based on difference in epiotopes, the antibodies recognize means the epitopes should not interfere, ab11175 and ab18255 immunogen sequence and hence target refer to two different proteins so these can not be paired in sELISA. You would need two antibodies against the same protein, both of them should be optimized for use as capture or detection. Please note both of these antibodies are not conjugated so you would need one of them conjugated or you would need a tertiary conjugated antibody. You may experience problems with tertiary antibody because it will detect both capture and detections antibodies because both ab11175 and ab18255 are rabbit; this will give you false results.